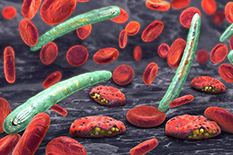 Malaria-causing Plasmodium parasites, shown in green, infect red blood cells. A University of Maryland professor is part of a team of researchers using satellite data and geospatial modeling in Myanmar for the first time to explore the impact and movement of malaria. Ultimately, the data and models developed by Tatiana Loboda, associate professor of geographical sciences at Maryland, and her team will help inform researchers, policymakers and public health workers in Myanmar and the broader Southeast Asia region about when malaria outbreaks are likely to happen, and which areas should be targeted to eliminate the disease. Malaria is a mosquito-borne disease caused by a parasite. Because of its warm, humid climate, numerous bodies of water and dense forests, Myanmar is “a mosquito paradise,” Loboda said. Southeast Asia faces a significant challenge of stealthily evolving malaria strains that are resistant to drugs. “When genetic resistance spreads, which can easily happen, we are likely to lose ground and see a massive resurgence of malaria everywhere,” Loboda said. This project is a seven-year effort funded by the National Institutes of Health, which has identified the work as an International Center of Excellence in Malaria Research Project (ICEMR). The principal investigators are Drs. Christopher Plowe and Myaing Myaing Nyunt of the Duke Global Health Institute. The project requires Loboda to travel across various regions of Myanmar for 90 days each year of the project. Loboda is working with a group of medical researchers to understand spatial patterns of malaria transmission in Myanmar. Professor Kathleen Stewart, a faculty member in the Department of Geographical Sciences and the director of UMD’s Center for Geospatial Information Science, serves as the mapping core lead on this project. Loboda and Stewart are specifically studying the environmental and human-mobility-related drivers of malaria transmission, with a goal to develop models that can predict the likelihood of malaria outbreaks in space and time. The team is working to develop a better understanding of subclinical malaria cases and genetic mutations that lead to drug resistance. Data collected by Plowe and Nyunt for the ICMER projects inform Loboda and Stewart’s models about the distribution of Plasmodium parasites—the cause of malaria—across Myanmar, which is not at all synonymous with mosquito distribution and cannot be observed remotely. “This is fascinating and truly exciting work with significant implications for global health outcomes,” Laboda said. The researchers are working with a number of U.S. and international collaborators within Myanmar, as well as in Bangladesh and China. Loboda is teaching researchers and public health officials in Myanmar how to run and utilize geospatial applications in their work with the aim to build a cadre of geospatial experts who can continue the work even when Loboda is not on site. Ultimately, that framework could be scaled up and applied to other countries. Read more here.